Some years are less difficult than others. Some days are less difficult than others. 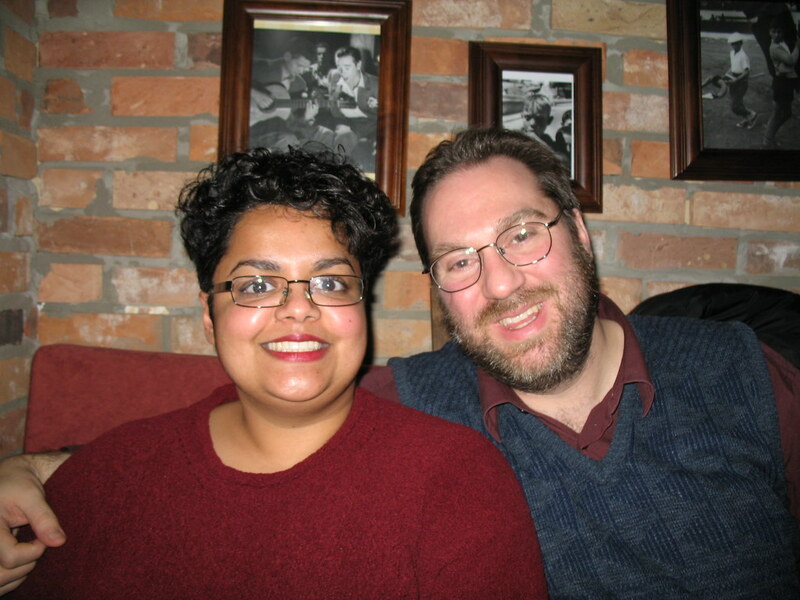 Every year I pause to remember The Fussy Eater, who died eight years ago today. Our time together was as long as The Fates saw fit. Today I remember him via food and film. A marathon viewing of The Hobbit trilogy in the TV Temple -- his TV Temple -- and supper of some of his much-loved foods. My versions of some his much-loved foods. Pizza with pancetta, mushrooms, roasted aubergine, black olives, sundried tomatoes, artichokes, roasted peppers, and onions with chicken wings on the side. Dessert is a Victoria Sponge, made the old fashioned way. His pizza would have seen the aubergines, olives, sundried tomatoes, artichokes and roasted peppers substituted with pepperoni, sausage, ham, bacon and maybe either salami or chicken. I'm not entirely certain he'd have had the pancetta, but I'll give him the benefit of the doubt. He'd have approved of boxed frozen wings that were injected and covered with who-knows-what. The cake would be passable, I think. He would have whimpered at the lack of chocolate, or that it wasn't the squidgy chocolate loaf he always not-so-secretly wanted. The films would have met with his approval. Thanks to the lovely people at Canongate Books who supplied me with a copy of this book. Note to readers: I am reviewing the original UK imprint. The American version, The World on a Plate: 40 Cuisines, 100 Recipes, and the Stories Behind Them, is published by Penguin Books. 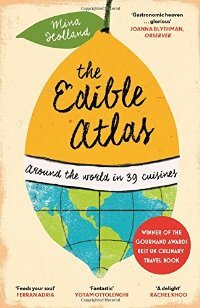 Mina Holland, editor of The Guardian’s Cook supplement and the newspaper’s food and drink writer, guides readers through 39 “key cuisines” in 29 countries and regions in her book, The Edible Atlas. Some countries such as France and Italy receive multiple spotlights while some regions such as the Levant and Scandinavia are lumped together as one cuisine. Store cupboard lists and recipes follow each culinary discussion. I must start this review by admitting to an error, which may or may not nullify this review: If it’s possible to read a book incorrectly, I have done so with The Edible Atlas. I tackled it as I do all books: I read it cover-to-cover. About one-quarter through I realised my folly. Given the breadth of subject matter, I should have thought of these as a collection of short stories or essays, tethered by foodways and often--but not always--by personal travel. I should have approached it as dim sum – grazing over perfunctory mouthfuls, each with different flavours and cookery techniques, as opposed to gobbling through a multi-course dinner, where each bowl and plate work harmoniously together. And in said gobbling, I found myself of two minds about this book. On one hand, Holland’s understanding of food as living and adaptive permeates the pages and invited me to note choice lines. While she states it’s impossible to recreate exactly a dish “since food is subject to the quality and provenance of ingredients, the preferences of its creator on a given day, the water, heat and equipment available,” she invites interested readers to try to capture the flavours and histories of various food traditions. One of my favourite lines, declaring cuisine “the edible lovechild of both geography and history,” is revisited over and over through high-level overviews of these intersections: Catalan separatism and its influence on art, architecture and food; the impact of China’s occupation of Vietnam on the people, and the role of small-scale agriculture in Ethiopia. I like Holland’s use of well-selected literary quotations to introduce each essay. Every region is captured in a few lines and cosy the reader into a new culture: Like Water For Chocolate introduces Mexico; The God of Small Things begins South India; The Hàvamål greets Scandinavia. Cute little maps, evocative of 1920s travel posters, also accompany each quotation. On the other hand, Holland’s leap from short form (much of what I’ve seen in her newspaper writing) to long form, is less-than-graceful at times, and makes the individual essays feel less secure than they should. In distilling interesting, factual and personal information into difficult-to-write hearty but snackable lengths, her voice vacillates from objective journalist report to schoolgirl’s vacation blog. At times I feel her words want to be written by Elizabeth David, Nigella Lawson or Tessa Kiros, but they fall short. I only notice this when Holland’s words strain to be breezily knowledgeable, but instead are aped authoritative bluster, of the ilk found in college essays. Occasionally the author reminds us she’s young and hip—getting jiggy with ingredients means you’re still young and hip in 2015, right? Infographics about specific topics, such as fried foods, the spice route, and grape varietals are interspersed in the text. Many are interesting, but one in particular caused knitted eyebrows and quizzical looks amongst my (Canadian) friends: while the “melting pot” of the Americas mashes together a wide range of colonial and immigration movements, the North American map doesn’t seem to accurately reflect the Canadian tossed salad’s colonial or immigration experiences. To someone unaware of the impact of the Seven Years’ War on the New World, it’s as if the Treaty of Paris (1763) never happened. But then again, Canada, appearing to not be a pet set of cuisines, is omitted, so this oversight isn’t crucial as her focus is what’s below the 49th parallel. Each section’s store cupboard lists are good ways to broaden a kitchen’s scope. In my battle against time, I haven’t tried any of the book’s recipes, so I cannot pass on my experiences. A warning to readers who want "authentic" recipes: some are of questionable provenance and are the author’s or her family’s interpretation of a particular dish. Then again, attaining authenticity in a cuisine where most ingredients are imported or may simply be unavailable is a tall order, and adaptations are reasonably expected. When I read this book, I kept asking myself, “for whom is this written?” To be truthful, my first response was a certain subset of boorish foodies who would use this book as a sort of dinner party Coles Notes or to otherwise impress someone on a first date (heaven help the rest of us). But really, it’s those who are at the beginnings of expanding their food experience who should take a look at this book. Holland’s ability to tie together socio-political events combined with issues of terroir provide a good introduction to the development of food cultures. This, combined with what appear to be easily accessible recipes should help those wanting to broaden their palates. Just don't read it cover-to-cover. The American text is different from the original UK text in the usual ways (assuming), and has been altered to include a new chapter on UK cuisine. As former Prime Minister, the Right Honourable Joe Clark said, Canadian cuisine is a cuisine of cuisines. And before you ask, I’ve had experience with wannabe suitors doing this sort of thing, in hopes I’ll be impressed with their knowledge of any particular subject. Yup. Still single. This year I offer one of my favourite spring/summer cakes to ring in my country's 148th birthday. 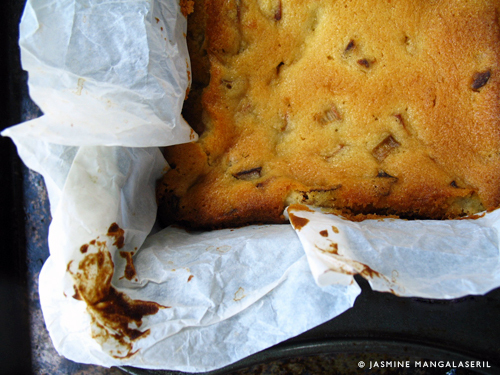 A lemon rhubarb pound cake. When I was little I wasn't very fond of rhubarb -- it was just too sour. My neighbour grew it in her garden and would give my mum jewel-like stalks. Experiments ensued. A strawberry-rhubarb something was by far my favourite, but I thought it would have been better sans the stalks. I'm not sure I'd come to the same conclusion today. Time passed and now I look forward to spring and summer, if not for the long ruby and green stems that I see thrusting from the ground, or bundled at my favourite country market. Neither my parents nor I grow rhubarb--so I can't just amble out and harvest some for my kitchen. One of these days I'll either plant some or befriend someone with a surfeit of the stuff. I must admit I do find rhubarb a bit of an unwieldy venture. The stalks sometimes feel as long as I am tall, and finding an out-of-the-way storage space can be an adventure. They balance on top of refrigerated containers of leftovers and bottles of milk or weave and precarious path between bottles and packets. If I'm not paying attention and let the lie on the counter, the cats bat at the tips and occasionally tear off the remnants of the (poisonous) leaves. Yes, I have cleaned up the evidence of their taste testing. Yes (again), I should be better about trimming off the leaves if the stalks are going to lie about for any amount of time. I'm not sure why, but in spring and early summer I tend to crave sharp flavours--lemon, lime, vinegary coleslaws--which is probably why I spend much of that time baking lemon and buttermilk cakes. Rhubarb seemed to be a natural addition to the batter, and a very good one. Slightly damp and just tart enough, this loaf is a more than welcome accompaniment to my afternoon tea. Rub the lemon zest into the sugar in your mixing bowl. Mix the lemon juice into the buttermilk and set aside. Sift together the flour, baking powder and salt, and set aside. Cream together the lemon sugar and butter. Add eggs one at a time, scraping down the bowl between each addition. Mix in the vanilla, if using. Add the flour and buttermilk mixtures in the usual way (dry-wet-dry-wet-dry), scraping down bowl after incorporating each buttermilk addition. Fold in the rhubarb. Pour the batter into the prepared tin, smoothing the top. Tap the pan a few times to release any trapped air bubbles. Bake for 90 minutes, or until the top is golden brown, the sides pull away from the tin and an inserted skewer is clean-ish (see notes). You can use the zest of the whole lemon, if you wish. 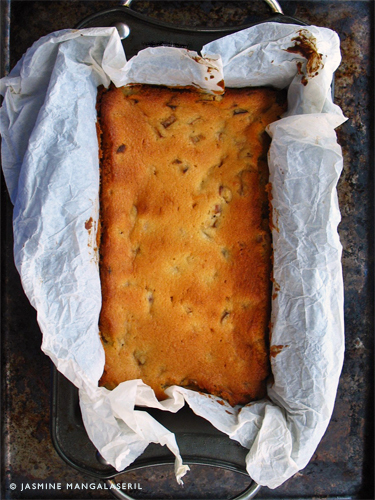 This is a damp cake--the skewer won't reveal crumbs, as with many other cakes, but a *slight* stickiness. I prefer this cake without icing or glaze, but if you prefer it enrobed, try a lemon glaze or cream cheese icing.